Is there a better alternative to FractionsPractice? Is FractionsPractice really the best app in Mathematics category? Will FractionsPractice work good on macOS 10.13.4? FractionsPractice is for the teaching and learning of fractions. Capable of generating thousands of different sums for practice. 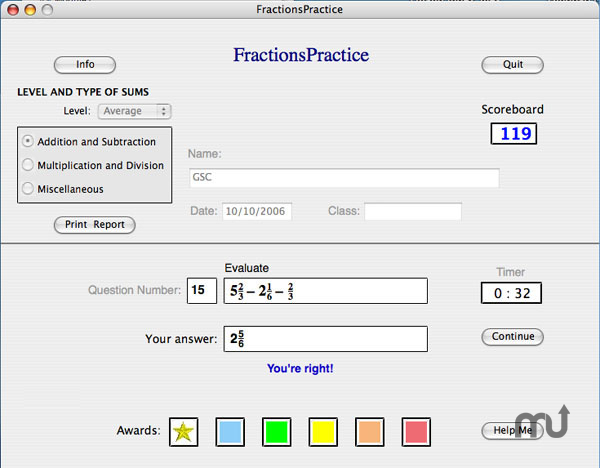 FractionsPractice for Mac OS Classic can be downloaded here. FractionsPractice needs a rating. Be the first to rate this app and get the discussion started! Four different levels of difficulty cater for students at different stages of the topic. The Basic level includes equivalent fractions, mixed numbers and improper fractions. The Easy and Average levels include addition and subtraction, multiplication and division and miscellaneous examples. The Advanced level includes negative fractions. Comes with more than 90 fully worked examples available through the Help button, to help students who need guidance. It marks automatically and reveals the answer if the student gets it wrong. A detailed report can be printed after each session.